Tony Blauer started researching fear and its affects on human performance in 1979 and after 10 years of unique research, developed the first behaviourally based system of self defence, the CEREBRAL SELF-DEFENSE: Mental Edge™ program. Tony is an accomplished marital artist and has appeared on the cover of Black Belt magazine many times. Showing his pioneering research, 11 years before the now world famous UFC (Ultimate Fighting Championship) burst onto our screens, Tony launched his PANIC ATTACK SYSTEM™, the first no-holds-barred scenario based contact simulation system incorporating scenario based role playing to accurately reflect the contextual reality of an attack on the street. It was 1987 when the beginnings of we now know as the S.P.E.A.R. SYSTEM™ and Personal Defence Readiness programme began to take solid form, when Tony developed a training drill that proved that cognitive muscle memory is never as fast as instinctual, subconscious movement. Gone are the days of learning hundreds of techniques, special moves and katas that rely on thousands of repetitions to build muscle memory. Instead Tony developed a way to harness our completely natural and most importantly instinctual protection mechanisms that we all have built in. Tony’s company Blauer Tactical Systems turns over an 8 figure sum annually, providing military and law enforcement S.P.E.A.R. SYSTEM™ around the world. In the 90’s, Tony recognized the need for a new generation of safety equipment that would not only allow students to train more realistically, but to feel and react in an integral way whilst remaining safe from serious injury. 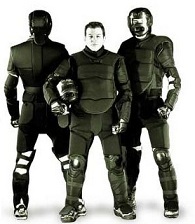 After considerable prototyping and development the HIGH GEAR™ Impact Reduction Suit was born, which is now used by military and SWAT teams as well as result conscientious self defence instructors the world over. In his Personal Defense Readiness programme, Tony now has a world wide network of coaches who are dedicated to making the general public safer.